Having a nice white suit for men with flat front pants in your wardrobe is what everyone needs. This 2 piece all white suit comes with great looking flat front pants by Vinci and has that classy style you are looking for. Put this white suit on to wear to a formal event or for a nice night out and you will look great. 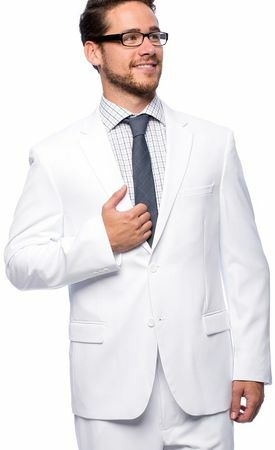 The 2 button jacket on this stylish white mens suit with flat front pants has side vents and of course matching flat front pants. Made of Poly/Poplin.